The once-wildly-popular Groinland Cutlery Corporation has made slowl business recently. 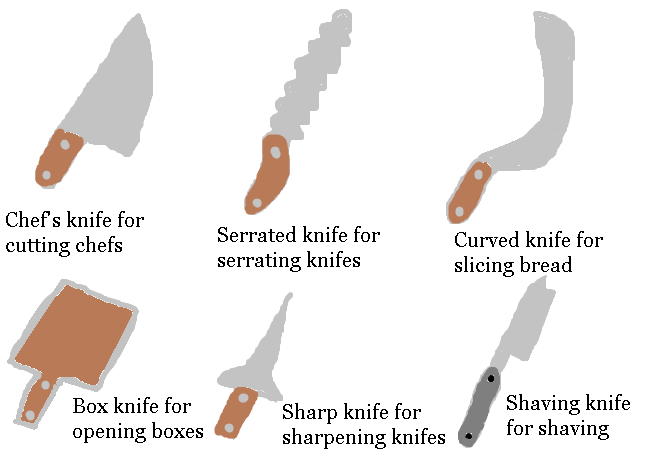 Although they used to design many new knifes every week, the main knife creater has been sick, so he has not invented any more knives. Sales have lagged, because people only buy products from the G.C.C when they are new. In the South Republic Prison, a team of Groiners (the Hurters) and Republicans (the Manglers) fought each other in a brutally disgusting game of Murderball. Although the Hurters did a good job of hitting the Mangler’s throwers at first, they eventually slowed down, giving the Manglers the advantage. It was a suspenseful and entertaining game, though. It is widely known that the Hurters do poorly because of their bad teamwork. However, some people have suggested that another reason why the Hurters fail is because they have a less aggressive name. 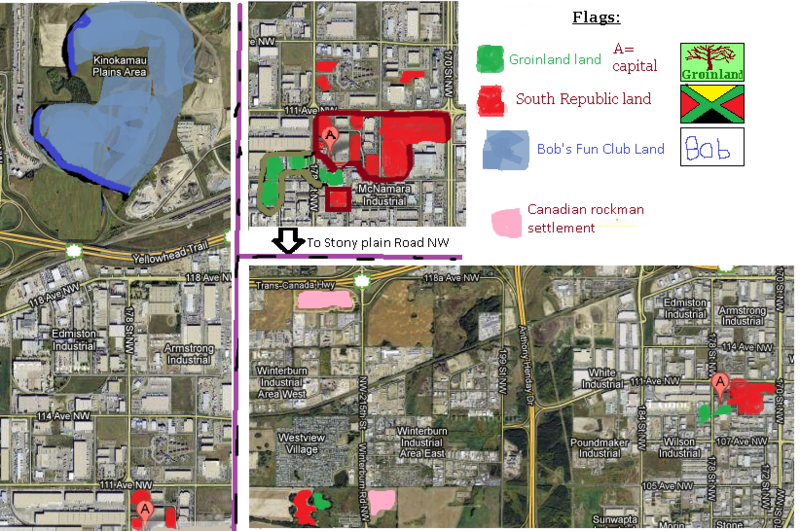 Internationally, Groinland is planning to plant roses in their newly-acquired plot of land. (located on territory that used to belong to the Dictatorship of Goddanged) Since the place that used to be Bob’s Fun Club is such a mess, the economy there is doing horrible. I do not really count the place that used to be Bob’s Fun Club as a real country, though. It seems more like a joke to me. Here in the South Republic, the economy has been going at a tolerable pace, although it has seen better days in the last few months. and their high prices for tours have boosted the economy significantly. because it was assumed the last snow of the season had already occurred. WE make the best knifes! It’s true, hands down! It is! Buy some and use them for whatever you feel like. Do you like to kill bugs? Get a bug murderer knife! Do you like to defend yourself? Get a self-defense knife! Do you like to be dysfunctional? Get a dysfunctional knife! We have lots of THEM! For all of your needs! All of THEM! We know you need to goddang your tooths all the time! You need to do it after every meal. Do it with our special Goddanged brushes for all of your tooths. Oh yes! Goddang them so they don’t goddang you! You might die of an attack from your heart if you don’t buy our stuff! Buy it now! Do you enjoy tasting food? Does your mouth water every time the word “food” or “eat” is mentioned? Do you like cooking and/or baking? You have found the right club! The local Food Taster’s Club has plenty of food-making and food-eating for the rock bottom price of twenty dollars a month. See you there! Let’s eat some yummy, tasty food together! Hopefully, someone in the club knows how to cook! SOUTH REPUBLIC ANNEXES GODDANGED TERRITORY! The South Republic legally took a lot of land from what used to be the Dictatorship of Goddanged recently. It amounts to 3 square miles. (meaning the S.R is now 175% of the size it used to be.) The land is far west, compared to the rest of the South Republic. Most of it will be used for farming. The rest may be used for building houses or stores. The South Republic also gave some of the land to Groinland. In their appreciation, Groinland gave the Republic 10 litres of water and 2 guns. That means that Groinland now has almost twice the land they used to. It sounds like a great opportunity for the Groiners! Since the owner of the G.C. Corporation started selling their newest batch of knives, they have been extremely successful. We predicted there would be a buying rampage, but this was beyond our expectations! People literally camped out to get their choice of the best knife. Catalogs were sold on the black market for up to $5, since you need a catalog to order a knife. Two people even died in the buying rampage! However, it has been good for Groinland’s economy. 4 DIE IN FIRST MURDERBALL MATCH EVER- MANGLERS WIN! The tourist market has been greatly expanding to the point that it currently constitutes the majority of the economy. This is very important, considering the lack of snow that has occurred recently. The tourists have been buying a lot from the General store in Capital City. –SNOW A low amount of snow has been sold. –ICE There is no ice in the area. -TOURISM The tourism industry has been doing extremely well since the War of Goddanged ended. Mean value: $6 Volume: 73 FIREARMS A few Southern guns have been made, and exported to Groinland quickly. Demand is good, and guns are fetching a high price. WE make the best knifes! It’s true, hands down! It is! Buy some and use them for whatever you feel like. Do you like to kill bugs? Get a bug murderer knife! Do you like to eat food? Get a food-eating knife! Do you like to be dysfunctional? Get a dysfunctional knife! We have lots of THEM! For all of your needs! All of THEM! We know you need to goddang your tooths all the time! You need to do it after every meal. Do it with our special Goddanged brushes for your tooths. Oh yes! Goddang them so they don’t goddang you! You might die of an attack from your heart if you don’t buy our stuff! Luckily, only one person has died this week. Everyone knew he would die, anyways. Mr. Poop Face died of cancer a few days ago. His funeral will be held at the Christianish Church in the South republic. He will be buried next to his dad’s final resting place. This is a disturbing “sport” invented by Groinland. Too bad someone had to invent it. Each team in Murderball will have at least 5 players and 2 reserves. More reserves are recommended because players will often die. 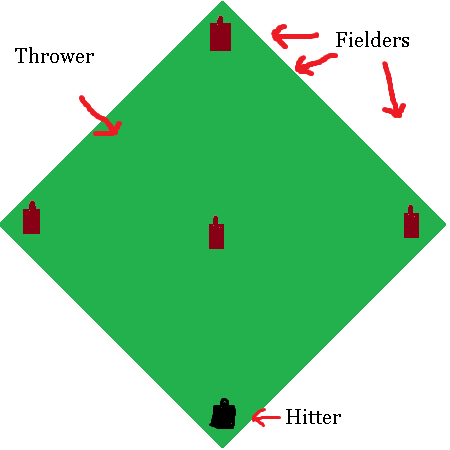 Each team must have three fielders, a Thrower, and a Hitter. There is also at least 1 Ref on the field at a time. Fielders will try to catch the Thrower when the Hitter hits him and sends him flying. If they succeed, no points are given in that round. Throwers run towards the Hitter. They also try to take the bat from the Hitter. If they succeed and beat on the Hitter, the Thrower’s team gets a point. Beat-downs cannot last more than 5 seconds, or the point will be nullified. The first team to get 5 points wins the game. There will be no fighting except that involving the Thrower and Hitter. If a Hitter murders a Thrower or knocks him unconscious, and yells “Murderball!” he gets 2 points. If a Thrower disarms a Hitter and murders him with the Hitter’s bat, (also shouting Murderball!) the Throwers team gets 2 points. If a member of a team runs away from the diamond, their team loses a point. If a player hits a Ref, they will be thrown out of the league. If a Ref hits a player, they will be yelled at. Hitter: The hitter uses a special bat made for shooting people into the sky. It is usually made of titanium. The bat cannot weigh more than one pound. 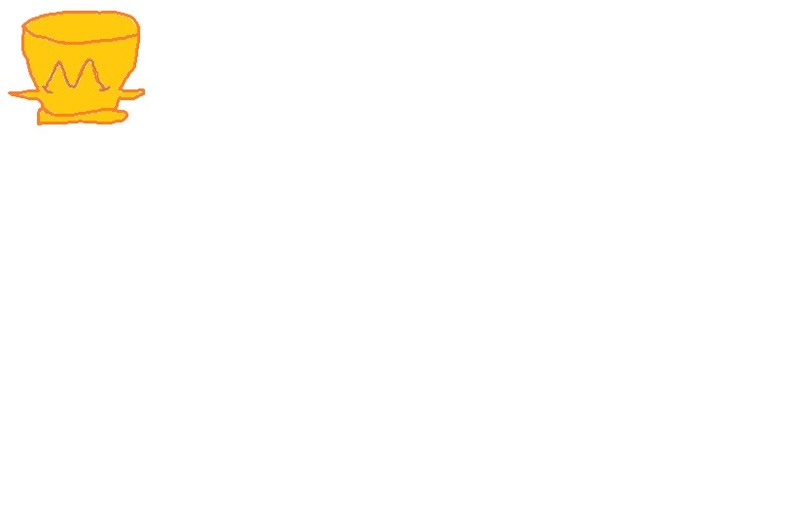 Thrower: The thrower wears plastic and sponge armor so he doesn’t get injured every time he gets hit. Fielders: Fielders wear regular clothes, but are required to dress at least partly like bodybuilders. Each game consists of 2 halves. Each half consists of 5 plays. So, the total game consists of 10 plays. Teams will play each other is an elimination-style way. After every game, they are allowed to change one player. Once there are only two teams left, they will face off in the Murderbowl. The team that wins the Murderbowl gets a trophy.